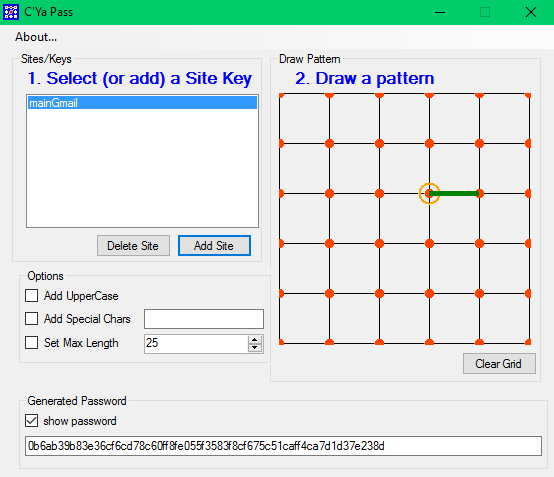 The easiest way to try out C'Ya Pass is probably to get the Windows version. The download is less than 1 Megabyte and it will only take about 30 seconds to install it. Once you get the app, I suggest you just try it with one password. All you have to do is add a site/key which will help you remember what you use the password for. You just click the [Add] button and type your site/key. Click the [OK] button and you'll see that the item is now highlighted. 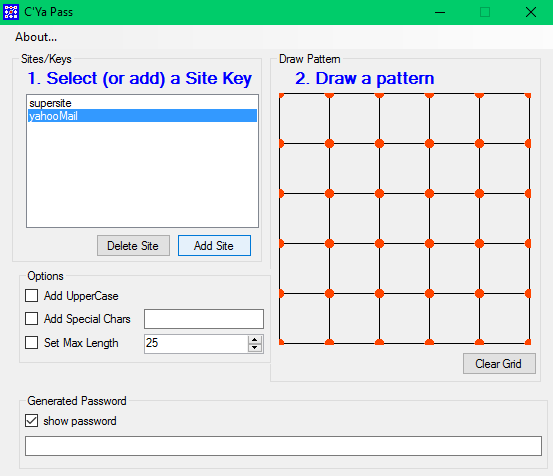 All you have to do now is draw a pattern that contains at least two points, by clicking the red posts in the grid. When you do, you'll see a strong password appear. 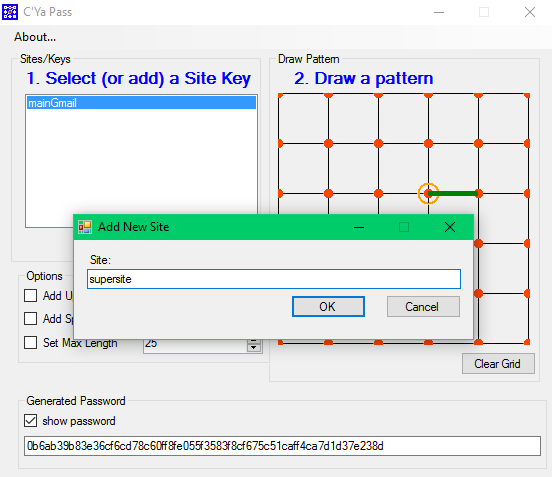 When the password is generated, it is also copied to your clipboard for ease of use. That way, all you have to do is move to your target site and paste it in the password field. Once you try it out with one password I believe you'll find the app to be extremely easy to to use. 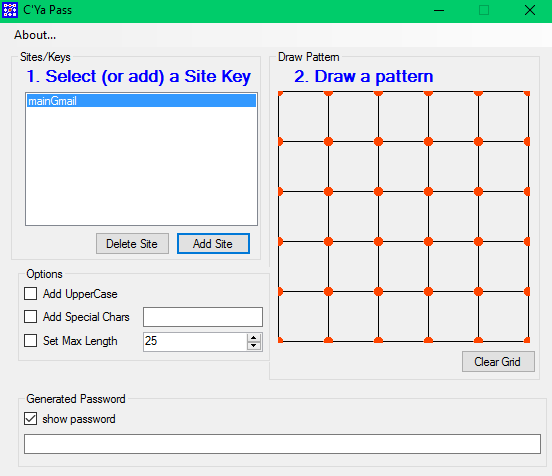 When you add a new site/key C'Ya Pass generates a new unique password for that site using your same pattern. I'll add a new one named supersite. Now, when I click the [OK] button, notice that I have a new generated password (and it's copied to the clipboard for me). It's that easy to start F*orgetting All Your Passwords. I've been a software developer for almost 25 years now and I'm very protective about the software I install on my computer and you should be too. 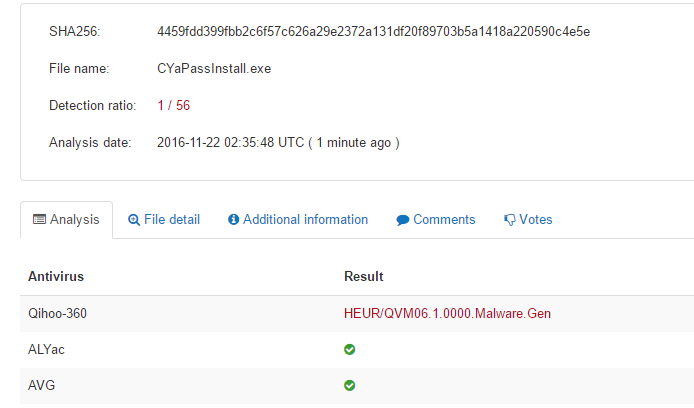 That's why I want to let you know exactly what happens when you install C'Ya Pass on your Windows computer. What Is Actually Installed? Only two things are actually installed. Here's a snapshot of the program installed on my computer. You can see that, by default it installs into your ProgramFiles(x86) directory. There are a couple of other files in there, but those are related to the installation so you can easily uninstall the application from Programs & Features in Windows. That's probably because I use the free installation package creator called InnoSetup. 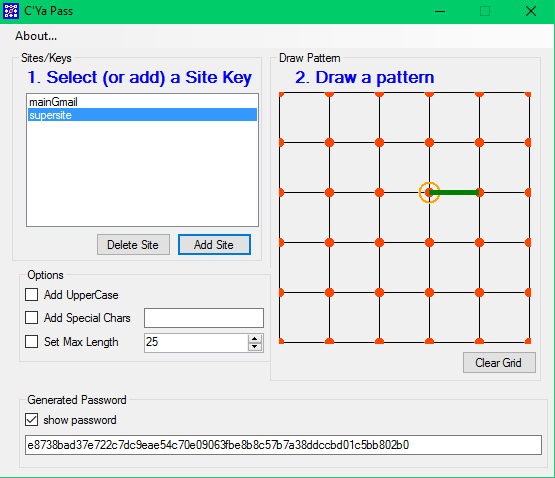 Once you run C'Ya Pass it will create one file when you create a new site/key. Those are the text strings that you use to remember which password goes with each of your logins. 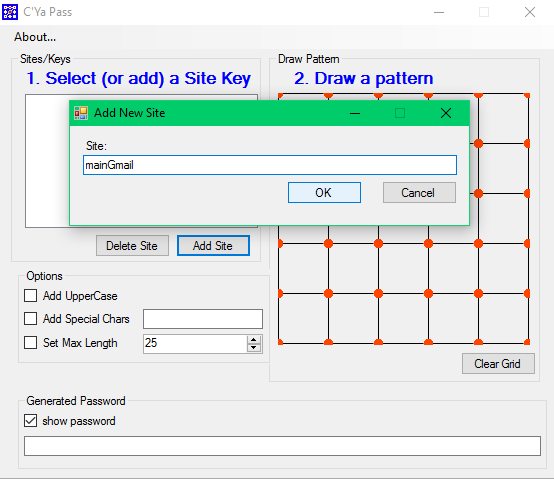 That's so that once you create the site/keys you don't have to create them each time you use the program. You can see the site/keys I'm talking about in the next image on the top left of the where I've highlighted the one (yahooMail). Where Are Those Values Saved? I save those files in a file in the JSON format (that's why I use the Newtonsoft.json.dll). When you add the first one I create a new file in a folder in your Windows AppData folder. That's the suggested location by Microsoft. However, I found that this seems to occur with this particular virus scanner and software built with Visual Studio Community 2015 (which is what C'Ya Pass Windows was created with).